Franklin Roosevelt’s nomination for President by the Democratic Convention in Chicago in July 1932 led to one of the momentous campaigns in American political history. FDR campaigns in Atlanta, Georgia. 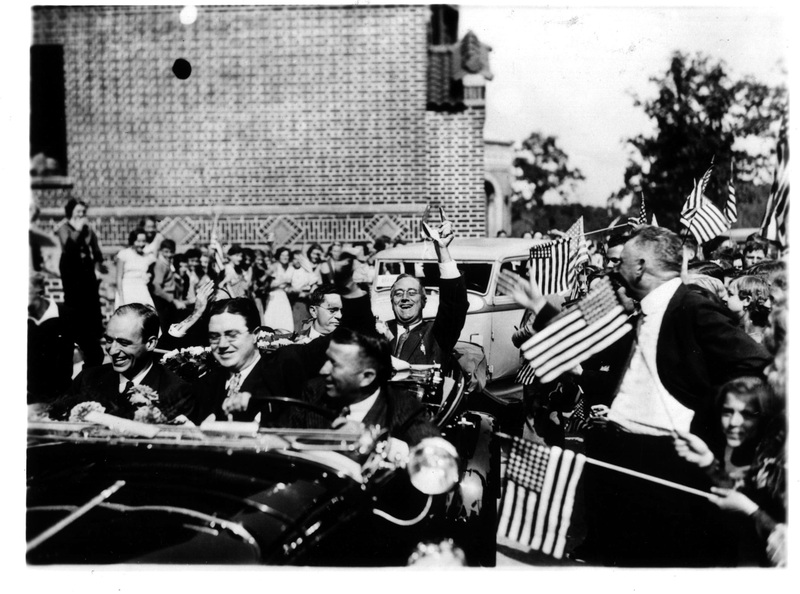 But from his first political venture in upstate New York, FDR had personally exulted in active campaigning, and in 1932 he felt the times and the mood of the country required no less. Accordingly he campaigned the length and breadth of the land, carrying his message into forty-one states and making a score of major addresses as well as hundreds of whistle-stop appearances. It was the most active presidential campaign to that time. Some of the positions FDR advocated for during the campaign, such as a commitment to lower taxes, balance the budget, and cut the Federal bureaucracy by 25%, came back to haunt him later. But his energy and personal charm nevertheless carried him to a sweeping victory on November 8, winning forty-two of the forty-eight states, an electoral vote margin of 472 to 59, and a popular vote of 22.8 million to Hoover’s 15.7 million.